Washing the car by hand, with the proper car wash tools and techniques, is the safest way to avoid washing induced swirls and scratches. Our services also include a two- bucket wash system that effectively removes dirt, grime, surface contaminants safely from a range of surfaces. It does not strip wax protection. Pressure washing is the use of high-pressure water spray to remove loose paint, mold, grime, dust, mud, chewing gum and dirt from surfaces. This service is done in a way that will not strip off your wax coating or ultracoat done on your car. Its the best and quickest tool for cleaning chassis parts and wheel wells. Summer Season? Scarcity of Water? No worries! Fastest way to clean your vehicle in between washes when light dirt is accumulated is to do Dry wash of the vehicle. 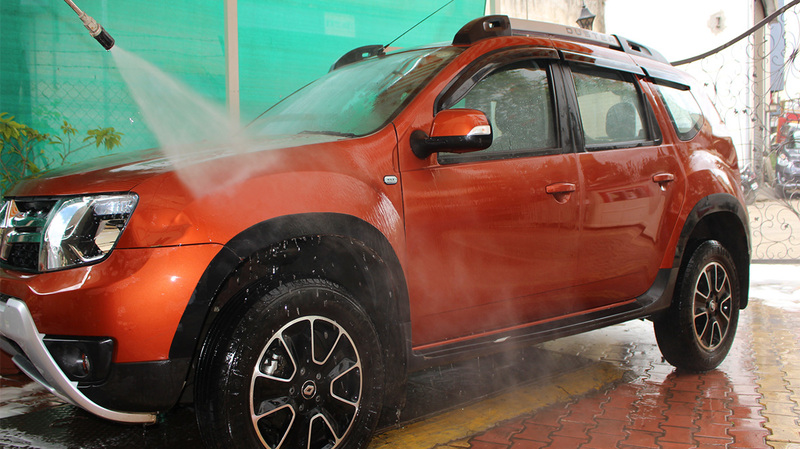 In dry wash treatment, we remove the dry dust with JOPASU Car Duster and then use a high lubricity pre-mixed spray detailer to heavily saturate a panel by carefully wiping off any dirt or road grime to a dry shine. It saves water, time and it needs no rinsing or drying. 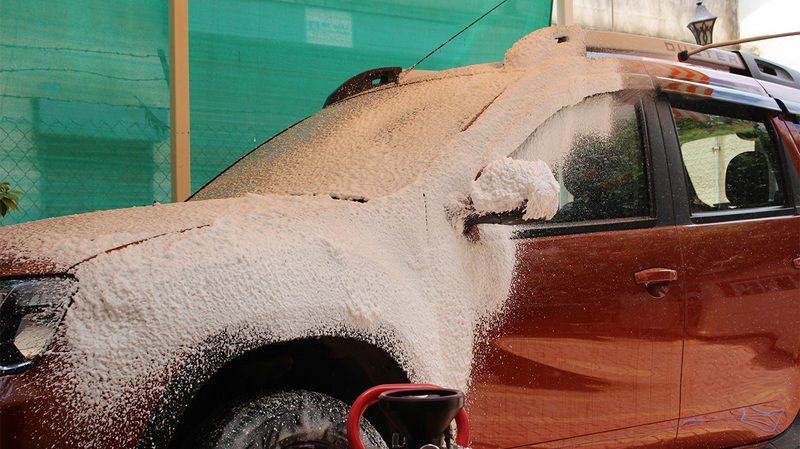 Foam wash involves covering the car with a film of foam using a foam lance connected to pressure washer. 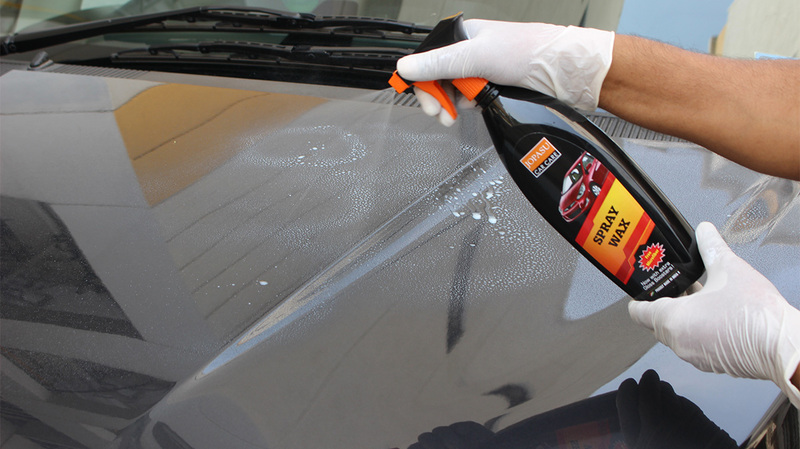 The thick foam clings to the vehicle, softens and holds dirt/grime in suspension; rubbing and rinsing action will give a clean and slick finish. Thus giving a less abrasive and scratch free wash. 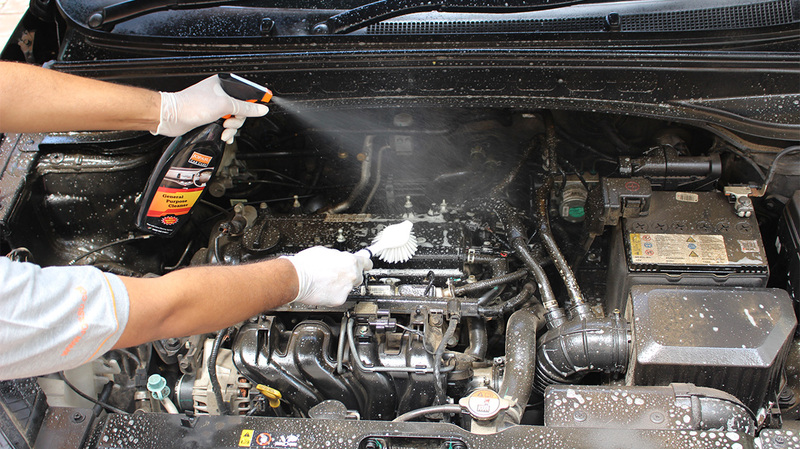 The foam itself works to help clean and lift dirt particles from the car. Advanced sludge formation within the engine can lead to reduced fuel economy, loss of horsepower and engine failure. 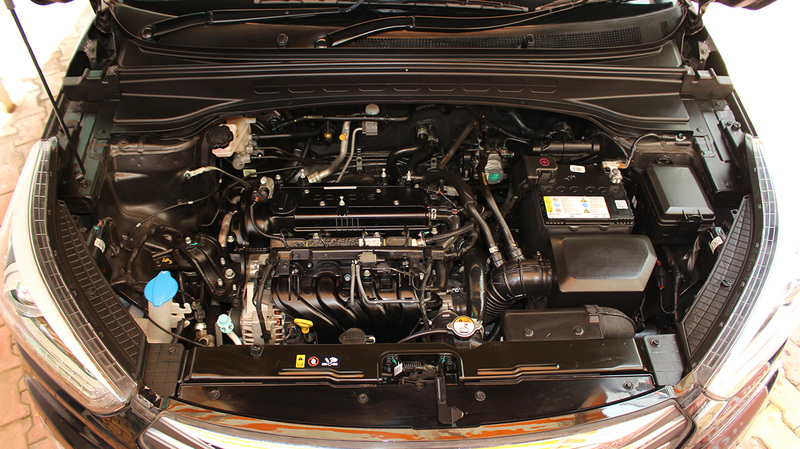 It’s very essential to clean the engine intermittently (1-2 times yearly in Indian environment) to ensure that you get the ultimate performance from your car. Thus reducing the incidence of engine fire significantly and extending the overall life of the car engine. 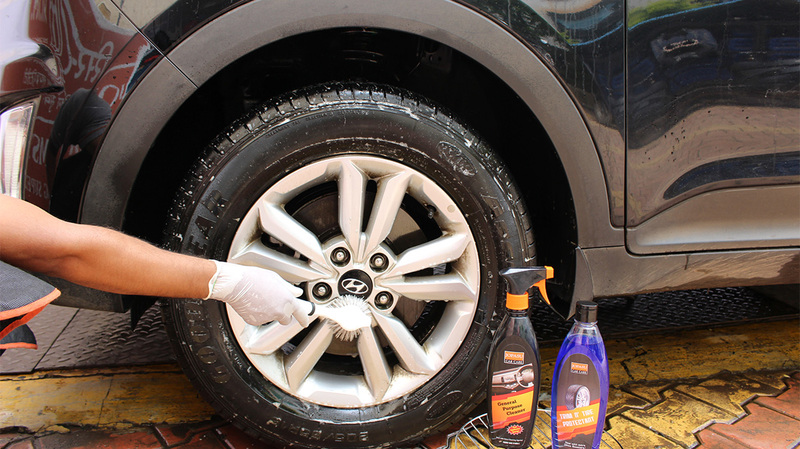 Alloy wheels can really make or break the look of a car, so it’s important to keep them clean. 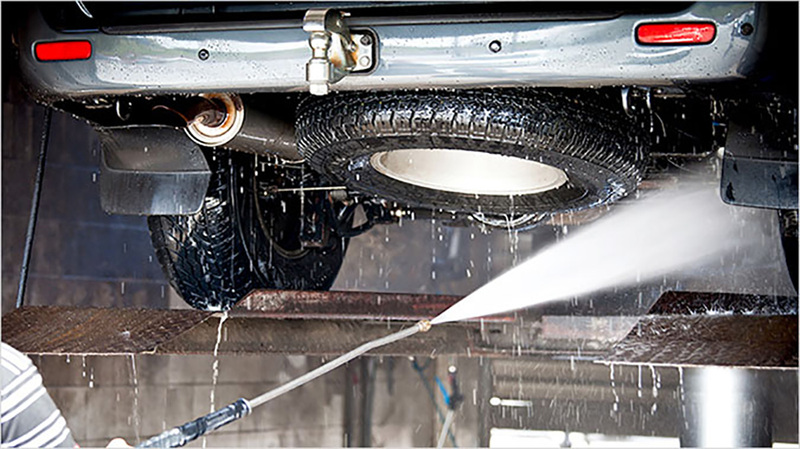 Our service includes: Rinse the wheel and wheel wells with the pressure water. 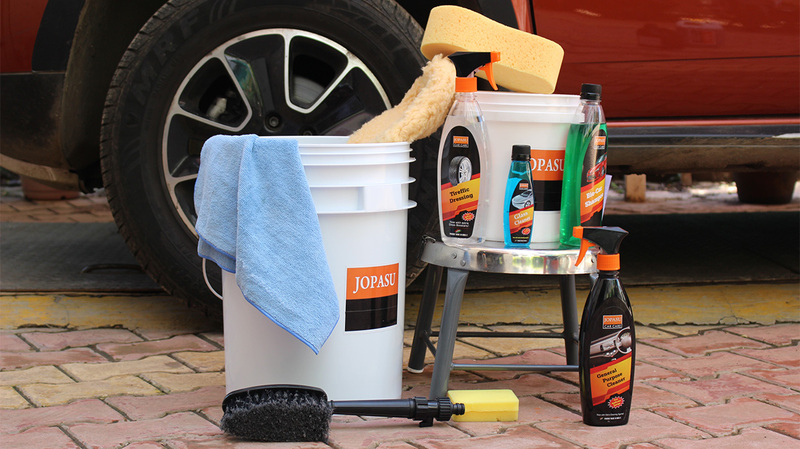 Applying JOPASU General Purpose Cleaner or JOPASU All Purpose Cleaner; Give time for the cleaners to react and brake dust; Scrub and brush to remove brown sidewalls and hard dirt; Tyre Dressing to give a rich look. Water spots are remnants of mineral residue that appear as blemishes on a vehicle's surface after the drying process. We recognize the severity of the problem and have the knowledge and correct tools to use in each situation, whether it's a gentle wipe with shampoo for milder cases, or the use of more abrasive polishing products for serious cases. 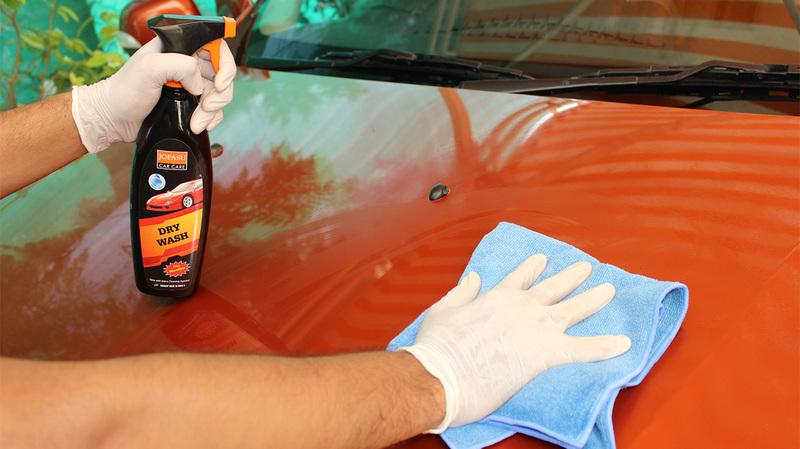 At our services we use Bug & Tar remover which is formulated to remove stubborn bugs and road tar from vehicle exteriors. We recognize the severity of the problem and have the knowledge and correct tools to use in each situation, whether it's a gentle wipe with shampoo for milder cases, Bug and Tar remover for some or the use of more abrasive polishing products for serious cases. Hence it leaves a glossy shine that helps repel future bugs, tar and grime. Bird droppings contain harsh acids that can burn through the car’s paint. We recognize the severity of the problem; check how old or new the harsh stains; have the knowledge and correct tools to use in each situation; and derive solution by using proper products and methods. Thus restoring paint colour & making paint finishes look like new. 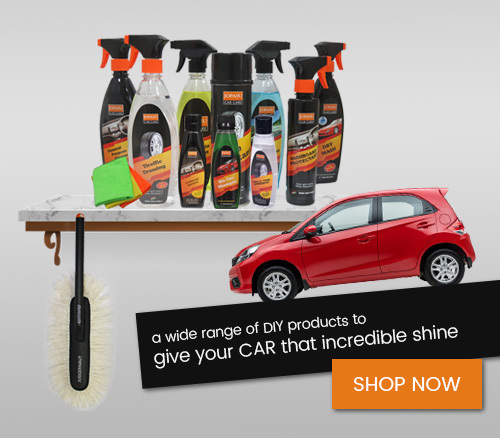 Instant Spray Wax Treatment is the fastest way to a dazzling, show-car shine. 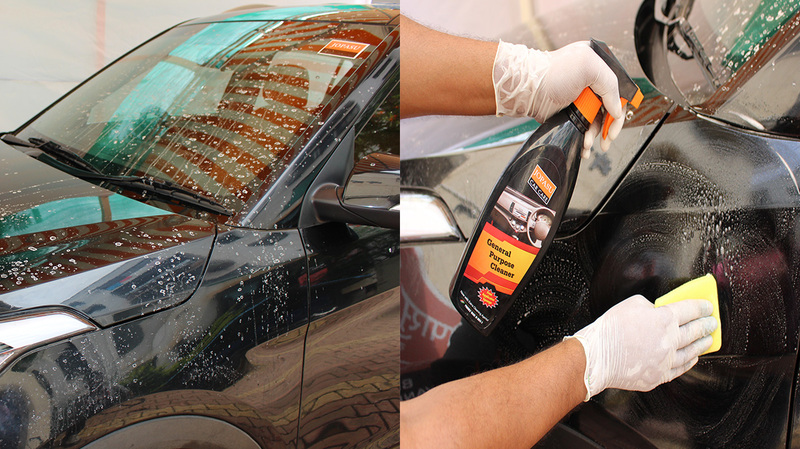 At our services, we dust off with JOPASU Duster, wash the car with JOPASU Bio Car shampoo followed by spraying JOPASU Spray Wax & then buffing with dry Microfiber in a circular motion to generate an excellent depth of gloss giving "just wet and waxed look". Wax provides a high lustre on the surface and removes light to medium scratches, oxidation and swirl marks. Polishing keeps the car’s paint healthy and looking good. The treatment involves application of JOPASU One Step Polish Wax that contains mild abrasives to strip away oxidation and minor paint imperfections and silicones with carnauba wax to produce a high gloss swirl free finish with long-lasting protection. Hard wax takes a bit longer to apply than spray wax, but lasts longer and provides better protection, especially during those harsh summer and winter months. The general rule of thumb is to hard wax your vehicle every three months while using spray wax in-between to maintain protection and shine. If you drive your vehicle in many harsh conditions (heavy rain, sleet, snow, hot days, etc. ), hard wax treatment is recommended once in three months. The JOPASU Paint Restoration System puts the shine back in automotive surfaces to give the cars that "like-new" showroom appearance. It’s a 3-step process which includes a trio of performance liquid products from JOPASU (J-Cut ++, One Step Polish Wax and Premium Paste Wax) applied in an easy 3-step process with 6-inch orbital polisher, followed by application of JOPASU Trim N’ Tyre Dressing & JOPASU Glass Cleaner for the car’s overall look. 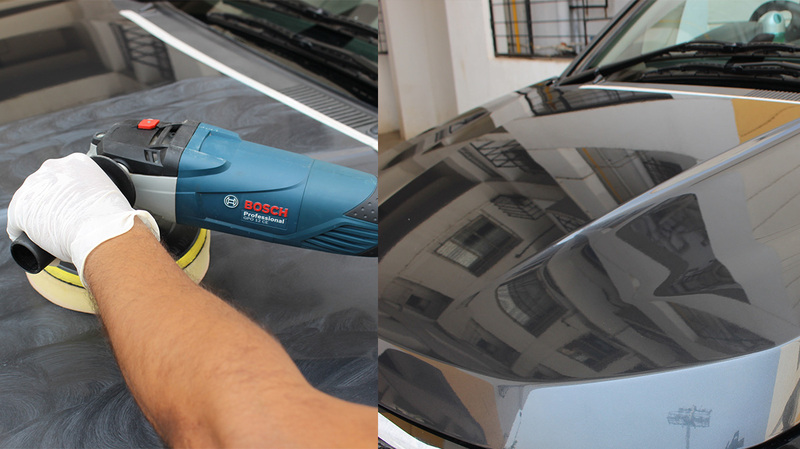 Teflon coating is just another layer of protection over the company paint job. It protects the vehicle from minor scratches. It is a transparent coating that lasts about 6 months after which you have to get it renewed. 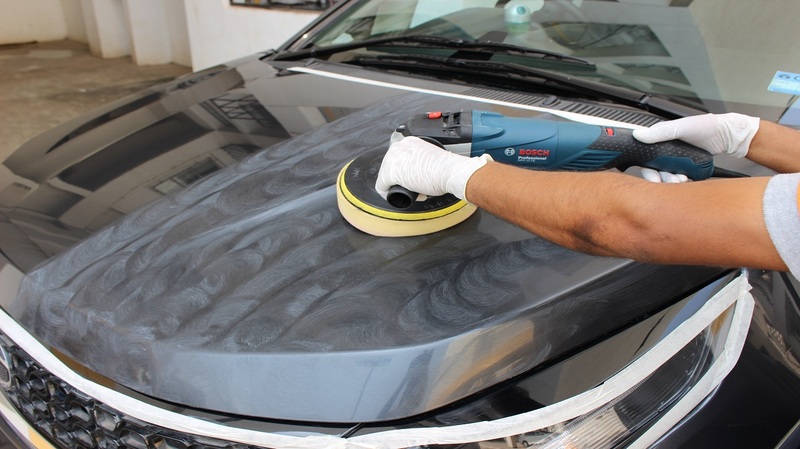 Putting a clear coat hard wax or Teflon coating on a car evens out the unevenness in the painted surface by filling up minor pits and cracks. 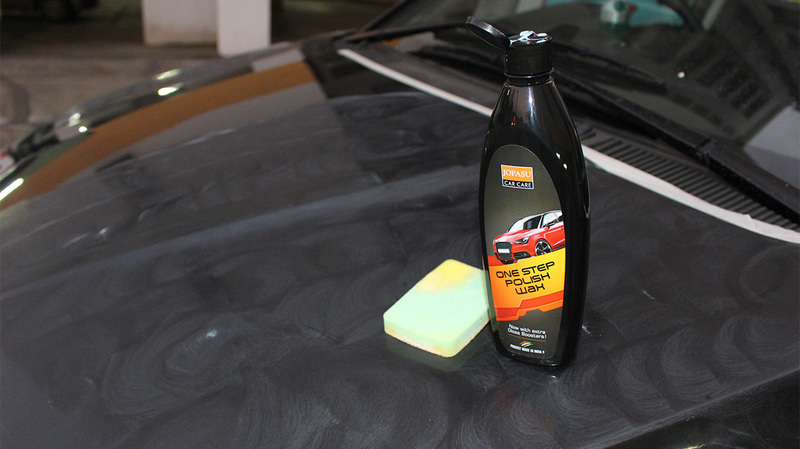 Teflon acts as an Anti-Rusting Layer thus helps in Improving the Paint Life of the car. If the headlights and tail lights are foggy, cloudy or just dirty beyond what a simple wash can alleviate, bring the vehicle to our services. We offer complete restoration services to get the lights as good as new. Replacing lights can be expensive, and it is much more economical to have them restored. We will buff your headlights to remove the oxidation and then polish the lenses. It is important to use a professional for this process to ensure no damage is done to the headlights. It includes the windshield restoration by removing the scratches and wiper tracks that create vision issues and protect them using our special windshield coatings. Minor scratches are eliminated, reducing glare and giving clear vision for safety. The Anti-Corrosion Treatment from JOPASU gives the car’s underbody a protective layer that prevents contact of metal with water preventing the formation of rust. Underbody Coating is a thick, rubberized paint that forms a 2-3 mm thick coating all along the underside of the car when sprayed on. Thus it keeps the coated area of the vehicle from chipping, on friction with stones or sharp objects on the road. 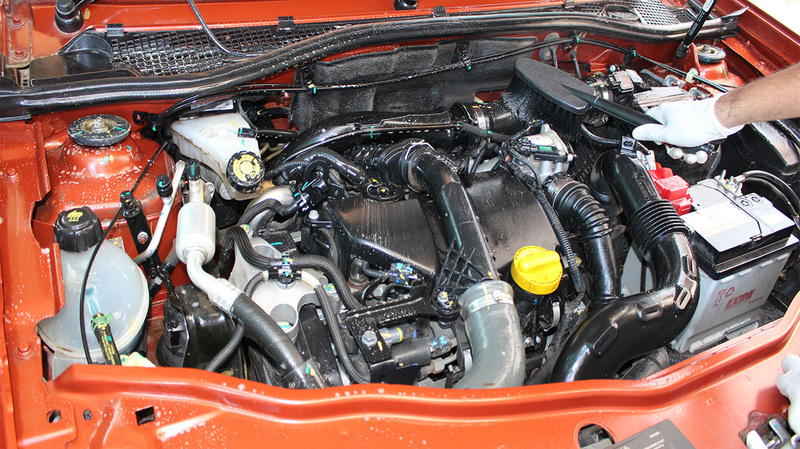 A clean engine keeps things running more smoothly and repairs are easier to find and complete. 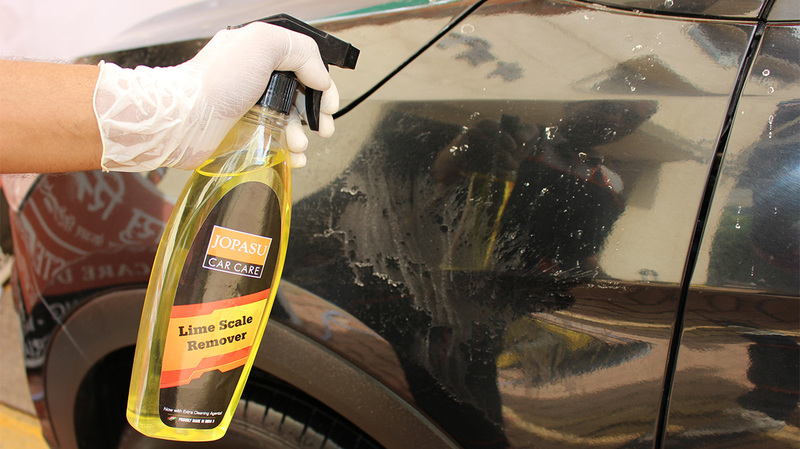 JOPASU provides a professional Engine Cleaner designed to save time, while cleaning the engine safely and effectively. We at our services first clean the engine by pressure wash. Engine Cleaner is sprayed and allowed to dwell for few minutes to react. Pressure wash is followed. Thus extending the work life of engine. 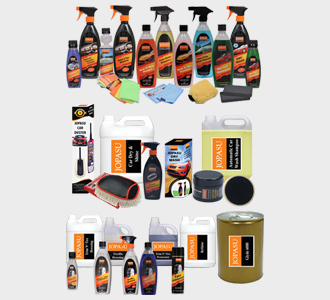 To provide a fresh and new look to the engine, we provide the best Car Engine Lacquer Coating using superior products. 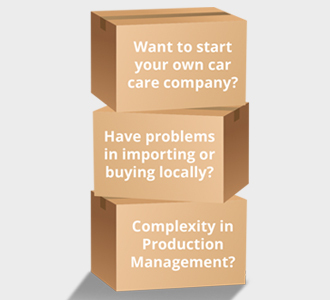 Our methods are absolutely secure and do not harm any part or component. The application forms a transparent, heat-permeable, protective coating, which is resistant against chemicals, aging, heat and weathering. 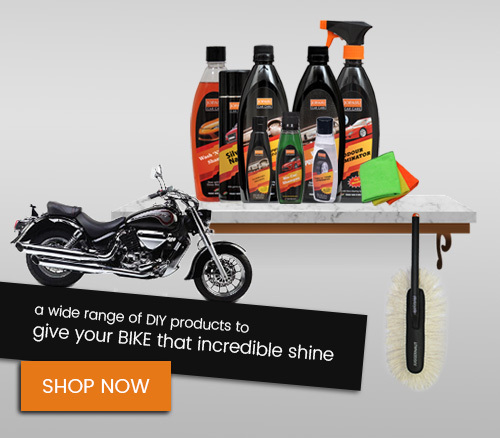 It helps to maintain good temperature stability giving new shine to the engine. 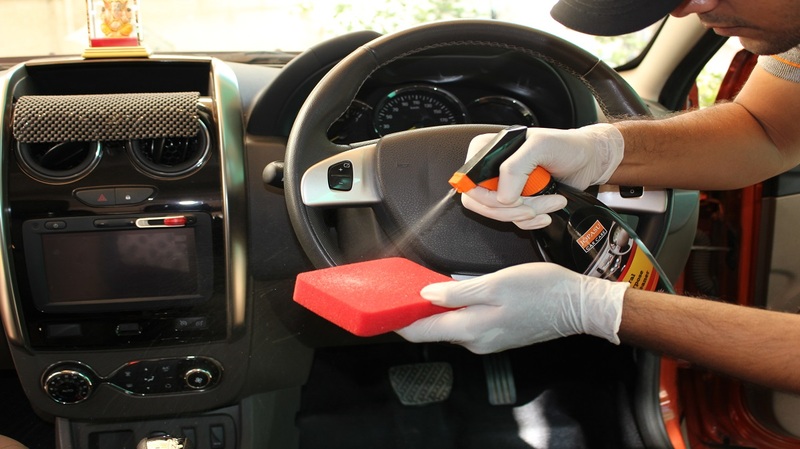 Interior Enrichment starts with cleaning of the interior parts of the car and it involves vacuuming, shampooing and cleaning of the surface of each component. Our service cleans car interior, removes dirt & marks in different areas of the interior surface. It include complete interior vacuuming and cleaning of seats, roof, floor, side panels and boot area; Wet extraction with Jopasu All Purpose Cleaner; Dashboard cleaning and dressing; Cleaning and polish of interior plastic parts & Glass cleaning. 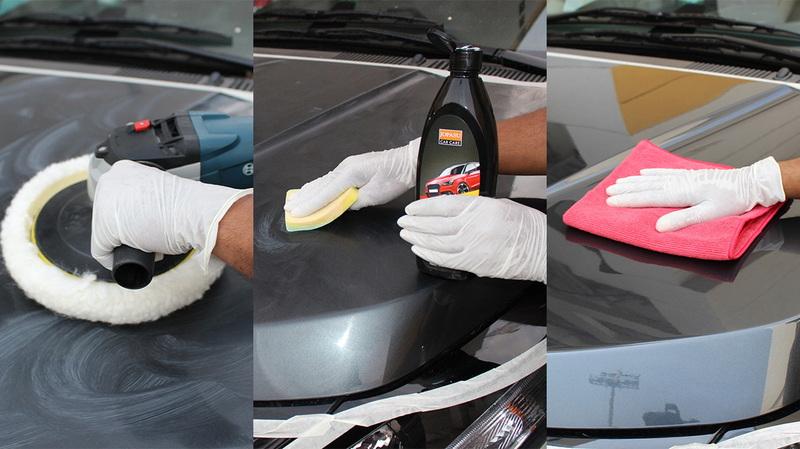 Refresh the car interiors and keep the car dirt free and squeaky clean with the Jopasu Foam It. 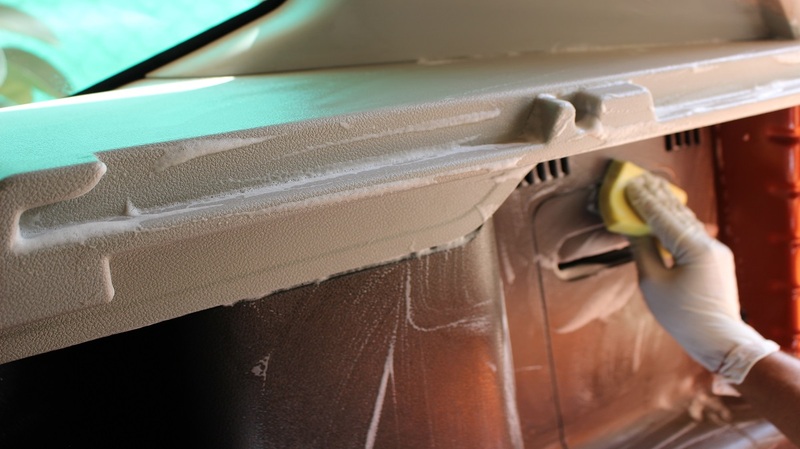 Our service cleans the interior of the car with a premium foam based product. Foam agents in the cleaner promote the suspension and removal of dirt by limiting the absorption of water in the fibres for rapid, dry cleaning of all car interiors fabrics. The service cleans car interior, removes dirt & marks in different areas of the interior surface. 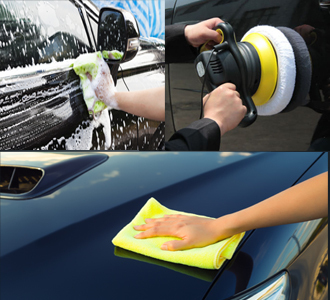 Our proven odor sanitization surface treatment technology completely removes unpleasant smells using a unique treatment method that is easily applied to fleets, vehicles for sale and any other interior area. We have introduced a range of specialized protective coatings and restorers for all the interior leather, vinyl and fabric materials in the car. Thus it kills odor by stopping the organic material from decomposing. The dirt, grime, grease, and moisture accumulate in the jambs and can stay there for years. If the vehicle’s roof “gutters” drains into the doorjambs, it’s a perfect place for forming rust. Joapsu wipes clean the door jambs with a full service wash. Our services also offers a full detail service that includes a thorough cleaning and polishing of all door jambs. Cleaning the doorjambs will greatly decrease the risk of rust forming around the doors. Clean the AC vent with the Jopasu AC Vent Disinfection. This removes the foul smell from AC vent and keeps the car smelling fresh. The air conditioner evaporator coils accumulate a lot of dust, dirt and moisture, and over a period of time starts breeding bacteria, fungi and mould. The air in the passenger compartment has to flow over the coils and hence becomes smelly and unhealthy. The cooling efficiency also drops due to the dirt accumulation. The AC cleaner and disinfectant aerosol has a foaming action that soaks the dirt and microorganisms and eliminates them. Our leather coating leaves an invisible layer that does not affect the look or feel of the soft leather and keeps the factory matt finish. It protects leather for the maximal possible time by protecting it from dirt, sweat, salt and fats. Its hydrophobic properties and strong bonding to the surface help to protect against pollutants that may penetrate the structure of the trim. To further increase the lifespan of the car, this treatment coats the inside of all accessible chassis rails and box sections with a purpose-made waxy rust-killer. It’s designed to protect hollow cavities in vehicles from corrosion. 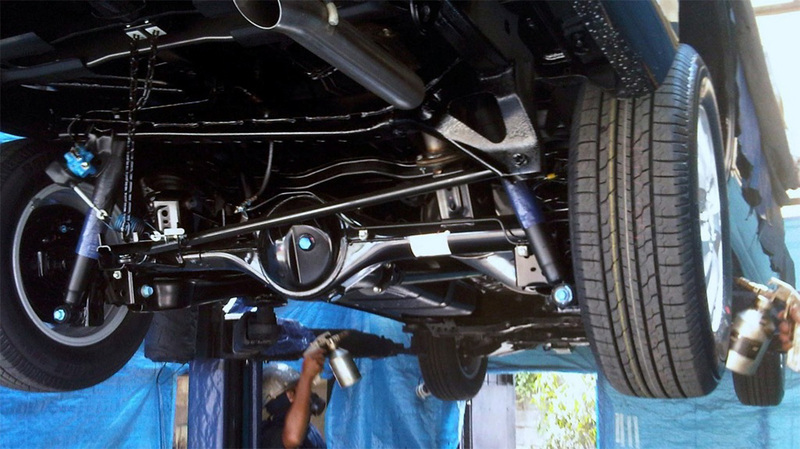 Also known as ‘rust-proofing’, cavity wax is generally applied to the vehicle underbody. Applied as a thin spray, the product will get almost anywhere, and has excellent adhesion to metal. 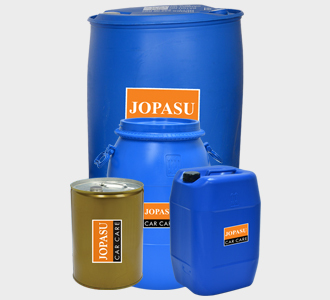 Jopasu Silicone Lubricant delivers the versatility to work in many applications. At our services we use our product for lubricating moving parts; eliminating squeaks caused by friction; protecting against rust and corrosion; sealing out moisture; preventing buildup of glues, waxes, inks and paints; preserving plastics, rubber and leather; and prolonging the life of cutting tools. Auto electronics and electrical parts like ignition components can become dirty and corroded over time through exposure to the elements. Jopasu’s Electrical Contact Cleaner is specially formulated to quickly remove oil, grease and dirt and restore electrical connectivity without causing damage. It is easy to use without removing any parts thanks to its ability to spray at all angles, including upside down. Jopasu’s Electrical Contact Cleaner has a powerful cleaning action, is quick to dry and to leaves no sticky or oily residue. Battery Terminal is specially designed to protect battery terminals from corrosion which is a major cause of hard starting and battery failure. It dries quickly to a soft film thus protecting battery terminals, pole terminals and plug connections from corrosion, weather and battery acids. Freezing water can seep into the window tracks and create drag when you try to open the window. That drag can damage the window regulator cables. Window Channel Dresser & Lubricant is a special product which keeps rubber channels of automotive soft and does not allow them to harden. It ensures smooth glass up & down movement thus reducing possibility of rubber getting damaged in the long run. JOPASU’s carbon remover / engine cleaner & degreaser is a combination of highly active, fast-penetrating solvents with selected detergents and corrosion inhibitors designed to remove carbon deposits, varnish, gummy matter, etc., from diesel engine pistons, rings, valves and other parts where oil combustion products may be accumulated. Silencer Coating is a heat resistant (up to 400° C) corrosion protective coating for metals, formulated to have a low viscosity at the same time provides adequate lubrication to free rusted linkages. Before coating the surface it needs to be cleaned & dried. It forms thin anti rust film on metal surface preventing it from further corrosion. Rust penetrant contains a solvent to dissolve rust, a lubricant to reduce friction and a surface tension reducer to get deep penetration. It penetrates deep into crevices, threads and seams to break the bonds that hold stuck parts together.